As this says it’s not a traditional moussaka. Traditional Greek moussaka is made with eggplant and this recipe uses potato in it’s place. I think that using both eggplant and potato would work really well too, but making a traditional mince and tomato base sauce would probably be a lot better than a can of braised steak and onions. 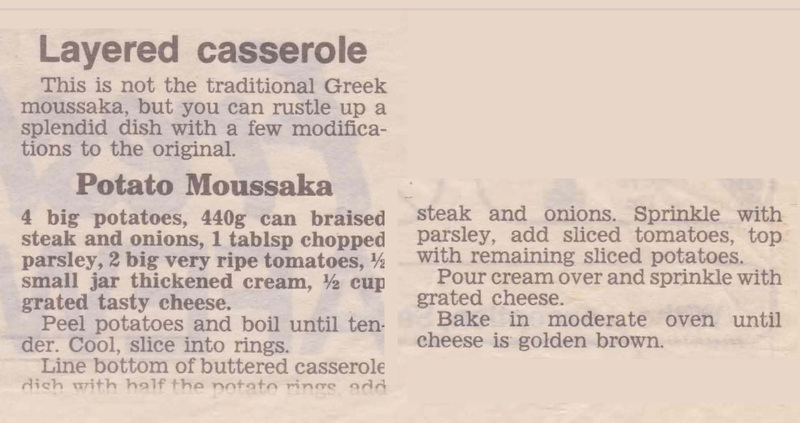 This entry was posted in All Recipes, Beef, Main Dishes and tagged 1970s, cheese, cream, mince steak, potato moussaka, potatoes, tomatoes by bebsrecipes. Bookmark the permalink.